Pioneer of the Concrete Poetry genre. Born in 1939 in Sławków, died on March 29, 2009 in Wrocław. Stanisław Dróżdż is a poet, an artist who focuses on the word and space, and a creator of concrete poetry. He treats his poetic/graphic artwork as an analysis of the reality of language, especially its visual forms. He studied Polish language and literature at Wroclaw University, graduating in 1964. At the turn of 1967/68, he began to produce concrete poetry. He focused throughout his career on the graphic possibilities for the visualisation of language, simultaneously searching for the reasons why it remains incapable of expressing reality. The artist also made it his mission to document achievements in the realm of concrete poetry. He was the creator of Concept Shapes - a type of concrete poetry inscribe in a broader context of visual poetry, which draws on elements of mathematics and logic. In 1979 he edited and published a book on Concrete Poetry from the years 1967-1977. He produced large spatial compositions, placing printed texts, symbols and numbers on gallery walls, floors and ceilings. These effectively become complex interpretations of the written sign and evoke various associations. He was a member of the Association of Polish Fine Artists (ZPAP) and snce the beginning of his career Dróżdż worked closely with the Foksal Gallery Foundation in Warsaw, exhibiting works that went on to travel the museums and galleries of the world. Of all the artist's projects, między / between is among the most recognised. 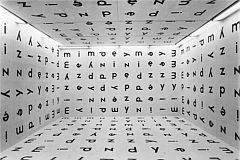 For this project the artist covered the white cube space of the gallery with even rows of randomly chosen letters forming together the word "między". The latter however never appeared directly. The artist in a way led the viewer into the text and into the word "między", drawing the spectator into the work to the extent that he or she is caught "between" the words. consists in isolating the word, making it autonomous. In isolating it from the linguistic context, as well as from the context of the non-linguistic reality, so as to make the word signify in itself and unto itself. In concrete poetry form is determined by content, and content by form. Traditional poetry describes an image. Concrete poetry writes with it. Dróżdż has throughout his career referred to his works as "ideaforms", derived from the forms of ideas, or concepts, that are realised at the moment of their formation in physical space. The artist has called them "substantial-formal, self-analysing codifiers of reality, integrating science and art, poetry and the visual arts". They come about as texts on two-dimensional surface and texts in three-dimensional space. Dróżdż's texts are highly varied: there are letter texts, word texts (Sandglass, Forgetting, 1967), digit texts (Solitude, 1967), sign texts (Uncertainty-Hesitation-Certainty, 1968), and texts-objects (between, 1977). Forgetting (Zapominanie) is one of Dróżdż's early poems, the form of the word "zapominanie" repeated a number of times one below the other. 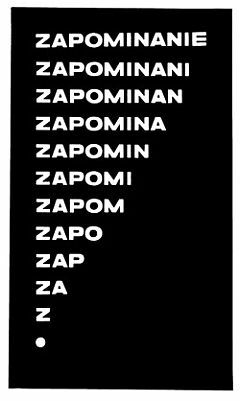 The word on top has all the letters, and in each consecutive line the word "zapominanie" is reduced by a single letter, until it is but a lone period. At some point, the word's original meaning gets lost. The three-part composition Uncertainty-Hesitation-Certainty incorporates punctuation marks only. The upper board is covered evenly with question marks, in the middle one question marks are mixed at equal proportions with exclamation marks, and in the bottom one the artist has placed exclamation marks only. In 2001, he won the prestigious Kościelski Foundation award for "combining in a creative and visionary manner two spiritual disciplines: art and poetry". In 2003 Dróżdż represented Poland at the 2003 International Biennale of Art in Venice with Alea Iacta Est / The Dice Has Been Cast. He welcomed biennale visitors to experience good fortune at a hand of die, providing six die on a table and tossed by each volunteer. Drawing upon the universal desire to win, the volunteers engage and then attempt to spot the combination they've thrown among the 46,656 possibilities, which are displayed on a wall of the pavilion. If they find their combination, they win. Stanislaw Drozdz's idea is a symbolic interpretation of the Biennale's theme, which has been defined this year as Dreams and Conflicts: The Dictatorship of the Viewer. It requires the viewer to cross the border between art and the real world. The artist has assumed that there is no conflict without play. Dróżdż's works are at once timeless and contemporary. Thanks to its autonomy and lack of reference to any specific context, the word in concrete poetry refers the viewer solely to the linguistic system as a relational grid. The works of Stanislaw Dróżdż are in the both public and private collections in Poland (e.g. National Museum in Wrocław, Muzeum Sztuki in Łódź, CCA Ujazdowski Castle in Warsaw) and abroad (e.g. Los Angeles Museum of Contemporary Art, Schwarz Galeria d'Arte in Milan, Museum of Modern Art in Hunfeld).